The Amy Winehouse Foundation Resilience Programme is our groundbreaking drug & alcohol awareness and prevention programme for secondary schools. Evaluated by academics at Harvard University and delivered in partnership with Addaction, we have so far worked with over 250 schools and 230,000 students across England. Our trained and accredited volunteers use their own experiences of substance misuse and recovery to educate students, parents and teachers about the triggers for substance misuse and what can be done to prevent it. These volunteers have all overcome significant personal issues and now live substance free lives, and empower others to make informed choices. It’s this approach – putting real life experiences at the heart of drug and alcohol education – that makes the programme so effective. We engage students in discussing their thoughts, feelings and behaviours and enable them to address issues such as low self-esteem, poor body image, racism and bullying without turning to drugs or alcohol. Said they were now well informed and that they could seek confidential help in the event of being concerned about substance use and 92% said they could seek confidential help for peer pressure or bullying. Said they would be more likely to avoid risky behaviours relating to substance misuse. Said they had increased confidence to cope with peer pressure and 70% said they had increased confidence to manage self-esteem. The report also shows that participants of a small pragamatic cluster randomised control trial (RCT), who had admitted drug and alcohol misuse, saw their drinking fall by 20 per cent 12 months after completing the programme. In the same trial, the number of pupils disclosing cannabis use fell over 40 per cent, while use of all other drugs fell by almost three quarters to just two per cent. In addition to this work, we have conducted a nationwide Prevalence Study, to determine the current levels of substance misuse among young people (including the use of Novel Psychoactive Substances, commonly known as ‘legal highs’). If we’re to create an honest and open environment in which informed choices can be made, then everybody in a young person’s life needs to be properly informed about drugs, alcohol and their related problems. As part of the Programme, clinical staff from Addiction work alongside the Amy Winehouse Foundation to help teachers better identify pupils who may be living with parents, carers or siblings who are misusing substances. We’ve also developed a resource to support parents. 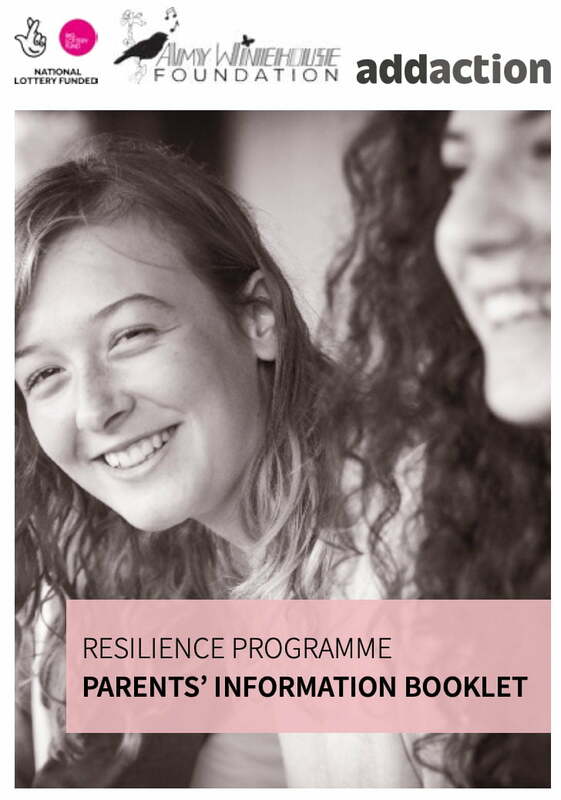 The Parents’ Information booklet includes background information about why some young people use substances and tips for how parents can have more effective conversations with their children about drugs and alcohol. It also includes details of where parents can access further support. Parents’ evenings to inform parents about the underlying reasons for substance misuse, the range of substances currently in circulation, and to encourage them to have better communication with their children. Sessions that incorporate real-life stories and ‘share sessions’ that provide a catalyst for further discussion around drugs and alcohol, as well as other issues (such as depression and self harm). Groups that build resilience in students, covering issues such as self-esteem, peer pressure and risky behaviour. Signposting to local treatment services. Pupils identified as at risk of being affected by substance misuse are given targeted supported through a six session Skills for Change Programme, or through one-to-one support from a local substance misuse treatment organisation.The teams include a specialist alcohol and drugs practitioner, a volunteer co-ordinatror and a team of volunteers who are in recovery. This work is currently partly funded by The National Lottery Community Fund, including a full Randomised Control Trial of the Programme. It is delivered in the following locations: South Yorkshire, Greenwich, Lincolnshire, Preston, Morecambe, Liverpool and Halton. Student, Kingsbury High School, London.